Editor's Note: This is the second of a two-part article. The first part can be found here. U.S. Pacific Command’s theater joint force land component command is currently accomplishing its directed theater shaping tasks. The structure is adequate and appropriate for what it was designed to do. However, in the event of a major contingency, Pacific Command would have to rapidly establish a larger, more joint and more complex organization for command and control of joint land operations. In order to bring a joint operations area joint force land component command (JFLCC) to fruition, joint force planners must weigh several considerations: authority, joint manning, and muscle memory. Authority is a perennial consideration that plagues commanders and staffs. While U.S. Army Pacific’s theater JFLCC currently operates successfully with “coordinating authority,” it will not suffice during contingency, which is exactly where the joint operations area construct for joint land component commanders gets controversial. When an organization suddenly has the ability to task and reorganize subordinates, it can quickly become personal and parochial for reasons such as historical grievances and inter-service rivalries. Therefore, combatant commanders must be very clear about the apportionment and allocation of forces by phase of the operation so that inter-service debates happen early during planning and not during conflict. In order to enable the transition to a joint operations area, the theater land component commander would need operational control of allocated forces; and at a minimum, tactical control. Phone calls, emails, handshakes, and promises will not deliver in war. Phone calls, emails, handshakes, and promises will not deliver in war. Determining the personnel requirements for U.S. Army Pacific to transition from an army service component command to also function as a joint land component commander in a contingency is essential to seizing the initiative. U.S. Army Lieutenant General Ricardo Sanchez, Commander of V Corps and Combined Joint Task Force-7 during Operation Iraqi Freedom, experienced this rapid growth in personnel first hand as his corps was expected to quickly grow by 1,000 people. However, unlike Sanchez in 2003, U.S. Army Pacific will be required to perform Title 10 roles and functions in addition to providing the nucleus of the joint operations area JFLCC staff. To conduct both missions appropriately, U.S. Army Pacific will need to create an operational command post. This will also necessitate two manning documents; one to fill joint billets on the joint operations area land component commander's staff and another to be filled primarily through the Army’s worldwide individual augmentee system. This manning process can take up to six months to complete, which is entirely too long in today’s security environment given the dynamic nature of war. Just as a brigade combat team gains an incremental level of proficiency that culminates at a combat training center, an army service component command’s staff cannot be expected to fulfill its mission in a contingency unless it has that same built-in muscle memory. Since U.S. Army Pacific has not exercised joint operations area land component command, U.S. Pacific Command should begin to institute that muscle memory with a commander’s conference, followed by a tabletop exercise, command post exercise, and finally, a field training exercise. Once these habits are ingrained, transitioning to this construct in a joint operations area will become second nature. The ability to transition from an Army service component command to a joint operations area land component command is not as simple as it appears. If it were, the Department of Defense would have gotten it right from World War II up to the present. Obtaining proficiency at this transition will require the attention and commitment of multiple commanders throughout the Pacific. Building the joint operations area command, manning it, and endowing it with the proper authorities are meaningless until it is able to conduct exercises to operationalize and validate its abilities. The concept itself is not difficult, but overcoming service cultures and parochialisms can certainly be a challenge. Let us presume that as Commander-in-Chief, the President of the United States has issued an execution order to conduct major combat operations in the Pacific. Crisis action planners then design a joint operations area which is approved by the Secretary of Defense. The commander of U.S. Pacific Command establishes a four-star joint task force and U.S. Army Pacific is designated as the Joint Force Land Component Commander. Since this requirement is above and beyond U.S. Army Pacific’s standing, theater-shaping responsibilities and its role as an army service component command, the timeliness of first steps is critical. Upon receiving the execution order, U.S. Army Pacific activates the joint time phased force deployment data. Army forces required to set the theater are prioritized to deploy. Key mission command enablers include an early entry command post to serve as the joint operations area land component commander in the forward area. This command post could come from I Corps or I Marine Expeditionary Force, much like the 10th Mountain Division did for U.S. Army Central during the early days of Operation Enduring Freedom. This command and control node would be required until the U.S. Army Pacific and joint land component manning documents are filled and the operational command post can relocate. Other key enablers include the logistics backbone, communication system architecture, and ground-based intelligence, surveillance, and reconnaissance capabilities. U.S. Army Pacific’s army air and missile defense command would also serve as the deputy area air defense command in support of the joint force air component commander, and provide protection to the homeland and forward deployed joint forces. Joint ground forces, to include Marines and special operations forces, would deploy early in the crisis to expedite noncombatant evacuation operations and secure vulnerable assets. Finally, medical, military information and support operations, and military police forces would deploy to set the theater for combat operations. Deploying forces to set the theater can take weeks to months, so identifying requirements early is critical to seize and maintain the initiative. The maritime nature of the Pacific theater of operations area does not lend itself well to interior lines of operation, which work best over land. Therefore, it is likely that the joint force would operate from widely distributed bases, necessitating the establishment of several joint security areas. U.S. Army Pacific, as the theater land component commander, would serve as the joint security coordinator for these areas. 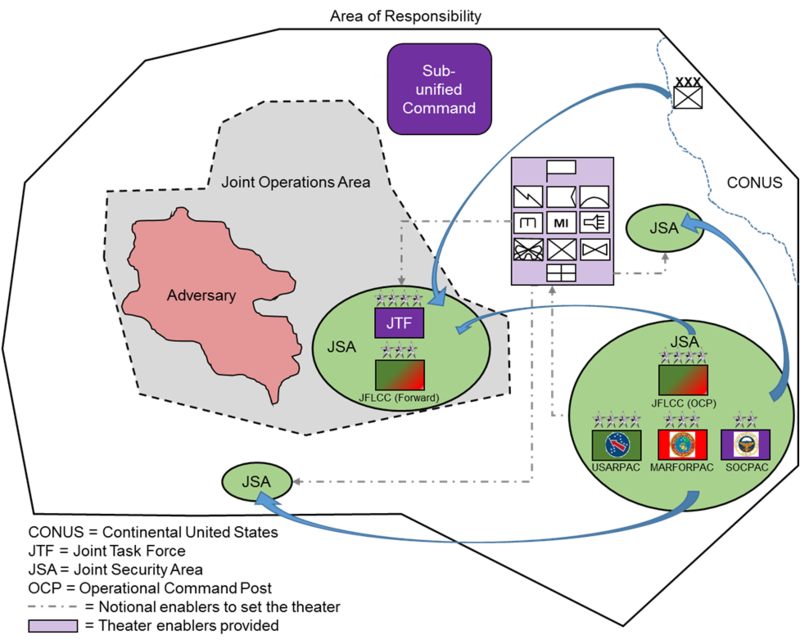 Clusters of joint security areas will vary in size, span international boundaries, and present a variety of unique threats and challenges. Each of these land features is a power projection platform that requires the theater land component to provide base security, line of communication security, and quick reaction forces. As the joint security coordinator, the theater land component would also integrate and provide support to interagency partners and the host nation. Additionally, this organization would provide sustainment for the joint security areas. Making exterior lines an advantage is complicated, but necessary in an anti-access and area denial environment. Figure 1 provides an overview of this entire process. While all of the above activities are ongoing, U.S. Army Pacific simultaneously fulfills its roles and functions as an army service component command. These include Army executive agent responsibilities and army support to other services. The Army is currently executive agent for 37 tasks, 29 of which apply to U.S. Army Pacific, including detainee operations, mortuary affairs, and contract linguistics. The Army also has 29 Army support to other services tasks including overland petroleum support, common user land transportation, noncombatant evacuation operations, and health services. In total, the Army is responsible for about 130 authorities other than executive agent and Army support to other services, all of which assist the joint force commander in setting and maintaining the theater. This vignette highlights internal Army issues familiar to theater army planners and is intended to showcase the enormity of the initial tasks and actions required to provide the joint force strategic agility and sustain operations in austere environments. This illustrative example also conveys the fact that there is simply not time to adequately establish proper joint command and control for land operations in crisis. Although not emphasized in the scenario, Marines and special operations forces will also be operating in the land domain of the joint operations area. If left to their own devices, they will likely operate in a loose coordinating relationship with the Joint Force Land Component Commander and the joint force must not relearn that lesson as it had to do in many contingencies since World War II. The theater land component commander must strive for interdependence between the land-based services and deliberately rely on each service’s inherent capabilities to provide reinforcing effects. In addition, the joint operations area land component commander must effectively employ joint land forces. In any contingency, political leadership will naturally delay decisions until the last possible moment. When political leadership does make the decision, they will expect the joint force to immediately seize the initiative. Planners must give all these considerations the due diligence they deserve in peacetime and continue to push the art of command and control of joint land operations. Following World War II, senior military commanders have repeatedly stressed that the services will never fight alone. But, in every subsequent combat operation, the joint force has learned through discovery what it has already captured in doctrine. The failure to implement a true joint land component command within the timelines required is not so much a lesson learned, but more like a lesson re-experienced time and again. So far, the U.S. military has been fortunate in that while it has never truly established perfect command relationships, neither has it experienced catastrophic failure in war. While the DOD cannot accurately predict the character of the next war, there are some certainties. Force structure is diminishing: active component Army strength is declining to 450,000 and that may be a waypoint to something less. Defense dollars are drying up and will not likely increase for many years. A joint land component commander in the future will have to do more with less and may have to contend with the prospect of actual failure. Despite the hard decisions all services have to make, the easy decision is to truly unify land operations across the phases of a joint campaign. In the future, national decision makers will expect joint land forces to seamlessly transition from dynamic theater shaping to combat operations. A lack of time is a recurring theme in the conduct of establishing command and control in America’s wars. Time is also the one resource that our senior leaders are most prone to squander. Whether it is Lieutenant General Robert Richardson arguing to serve as Admiral Chester Nimitz’s land component commander three years into World War II or Sanchez trying to employ his combined joint task force at the beginning of the insurgency during Operation Iraqi Freedom, the theme of time is unforgiving. In the future, national decision makers will expect joint land forces to seamlessly transition from dynamic theater shaping to combat operations. Decreased indications and warnings, compressed planning timelines, and austere defense budgets drive planners to consider more adaptive ways of organizing and employing landpower, and the JFLCC construct at both theater and joint operations area echelons presents viable options to do just that. For landpower practitioners, the best chance to realize an Army service component command quickly transitioning to a joint operations area land component command is to continue incrementally demonstrating the value of the existing doctrine and emerging concept; while looking for ways to employ it in the future. In short, innovate and practice the art of command until the science catches up. Title 10 of the U.S. Code defines the role of armed forces in addition to providing the legal basis for the missions and organization of each service component. These tasks include the responsibility to organize, train, and equip forces. U.S. Combined Arms Center, “ARCENT Transition to Combined Joint Task Force – Operation Inherent Resolve: Lessons and Best Practices,” Initial Impressions Report, no. 16-10 (March 2016), 5. A set theater is one that is sufficiently postured to achieve and sustain theater campaign conditions, enable contingency response, and execute through the “deter” phase of plans, without significant resources from outside the area of responsibility. John A. Bonin, “U.S. Army Forces Central Command in Afghanistan and the Arabian Gulf During Operation Enduring Freedom: 11 September 2001-11 March 2003,” Monograph 1-03 (March 2003), 7-12. Should conditions warrant, this mission command node could become a 4-star joint task force or sub-unified command. If that were the case, the joint task force or sub-unified command would need its own JFLCC to plan and synchronize land operations in the joint operations area. U.S. Joint Chiefs of Staff, Joint Publication 3-10: Joint Security Operations in Theater (2014), vii-xvi. “DoD Executive Agents,” Office of the Administrative Assistant to the Secretary of the Army, accessed June 8, 2016, http://www.oaa.army.mil/AEA_functions.aspx. Theater Army Operational & Organizational (O&O) Concept (V5.4), 11 December 2009, p. A-4. Department of the Army, The U.S. Army Operating Concept, 30. Department of the Army, The U.S. Army Functional Concept for Engagement (2014), 17.